I am still in the midst of organizing (and reorganizing) my home. In my mind, once I have spent the time, energy, and resources to do so, I shouldn't have to do it over and over again. Why didn't I get it right in the first place? Organizing, I have found to my dismay, is an ongoing, never-ending, occupation. On the bright side, I have found that the challenge has made me think out side the box on many occasions. I am learning new things, and my stress levels drop considerably when I accomplish a task and get rid of things we no longer need/use. I love to read about how others have organized their spaces and from them I glean ideas and then I try to incorporate their ideas in my home. One of the challenges I set for myself was to stay within a non-existent budget for my organizing task. I am learning to recycle and upcycle. I find myself looking at something I really like and try to figure out how I can use it, first as what it was made for, second, can I use it for something other than what it was made for, and third, does it fit in my budget. For example, I have an entertainment center that I absolutely adore. We have had it now for ten years. My Man found it in the want ads of our local paper. We were in need of one at the time and it was worth the hour drive there and back to take a look at it. I fell in love with it as soon as I saw it. 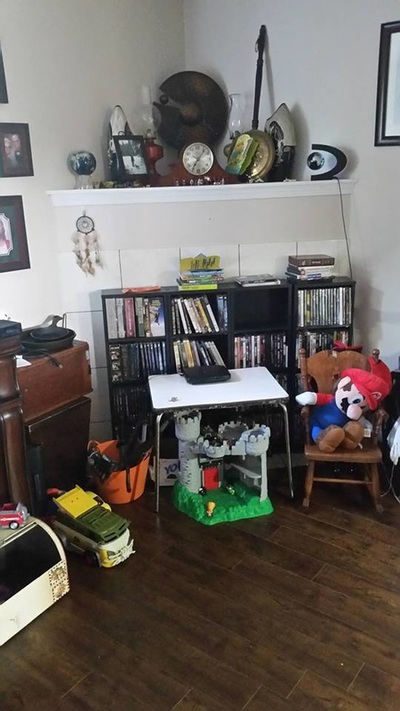 Mainly, because it doesn't look like an entertainment center. 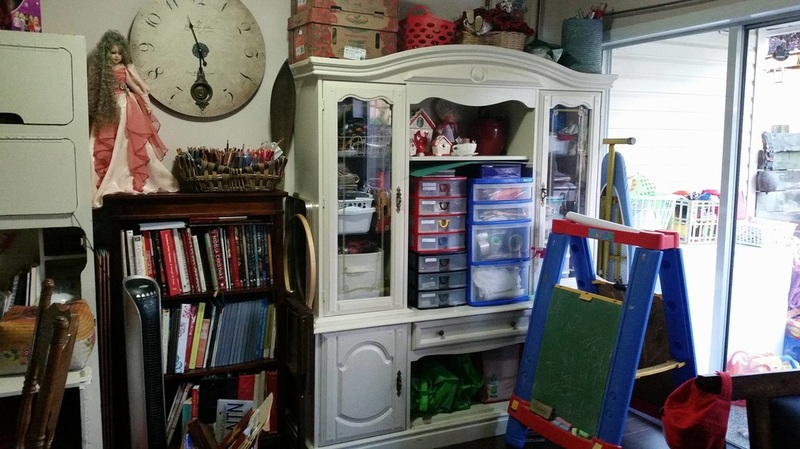 To me, it looks more like a china cabinet, but the people said it was an entertainment center. Second, the price was $50. We loaded it into our suburban. Thank goodness it is in two pieces!! We brought it home, and we used it as what we bought it for. Over the years, it has been used in my kitchen as a microwave stand/kitchen storage/display area for my collectibles (yes, it's that big). 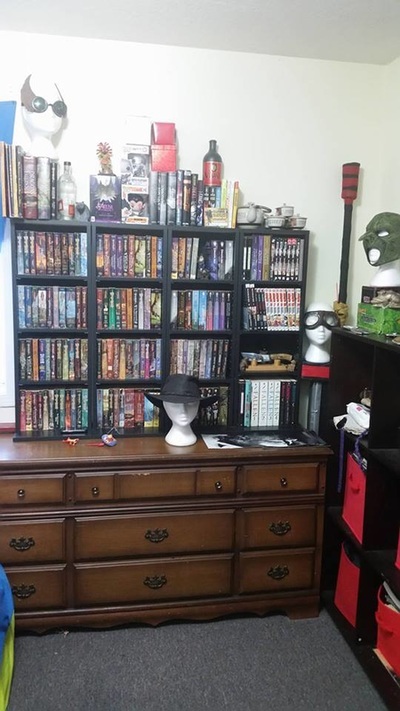 It has been used in our bedroom as a dresser/ tv stand and it lived a couple of years at our son's house doing duty as a dresser and as a display cabinet for his larping gear. It found it's way back to our home last year and I am currently using it as a craft storage cupboard. Upcycling at it's finest!! It was $50 well spent. Another example of sort-of- thinking outside the box: We have an extensive DVD collection (we love movies, just don't like going to the theater very much). Over the years, we have stored them on shelves made out of boards and bricks, on bookshelves, and in boxes in our closet - THAT was a pain in the you know where! 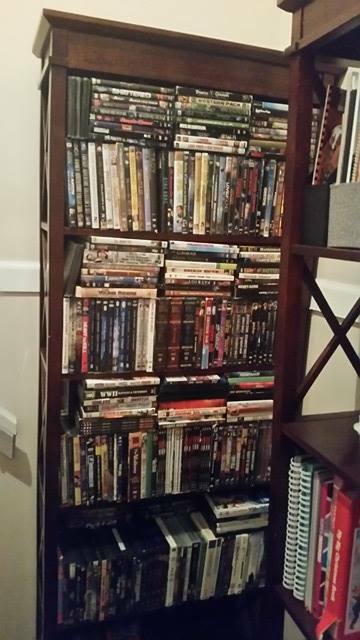 We downsized the collection when we moved into our current home, but we still have close to 500 plus DVDs. We found three wire DVD holders, which, of course weren't nearly big enough and so I invested in a set of wooden DVD stands. They needed a place to reside while doing their duty and we put them in front of the corner gas fireplace, which we don't use, in our front room. I still had three boxes in our closet. It wasn't long before they began to bug me. It was such a messy looking area, and I couldn't reach the mantle without moving all of the shelves. One of our sons gave me a binder that holds CDs, and I started putting the DVDs in the case. I took the bookcase out of our bedroom and put it on the stairway landing, next to the matching bookcases already there and I collected all the DVDs that didn't fit in the binder and moved them to their new home. I recycled the wire stands by giving them to a neighbour and our son who lives with us, took the wooden ones into his room. He was reluctant at first, because he said he didn't have room for them and what would he use them for? I suggested that he put them on top of his dresser and put his collection of Dragonlance books in them. He had them piled everywhere in his room. He tried it and he was impressed that mom actually knew what she was talking about! I have a lot of craft supplies that I need storage for. I don't have the space for the Rubbermaid bins that I love to use anymore. 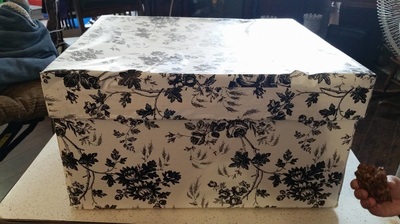 I eliminated the crafts and their needed supplies that I don't really do a lot of and concentrated on the ones I really enjoy such as sewing, crocheting, knitting, and quilting. I also enjoy doing a bit of artwork now and then such as painting and colouring. I will be sharing a bit more on my studio area in a future post, but I wanted to share another little project that has (or will once I get more organized in that area) made a difference. 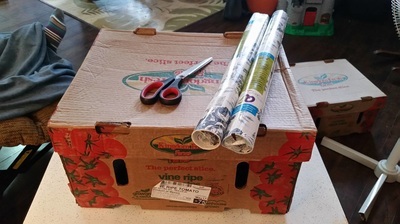 I asked one of my daughters-in-law if she could bring me a few of the tomato boxes from her work. She works in a fast food place and the boxes were being recycled, so she just recycled them to me! I love these boxes!! They are small and square and I have found so many uses for them!! The one I want to share today is very simple. I wanted to use them in my studio for storage, but they looked kind of grungy. I wanted something a bit more refined. One day, when I was at the dollar store, I saw some rolls of contact paper (some people call it mac-tac) and a light-bulb went off in my head! I bought several rolls and presto! My grungy looking cardboard boxes were transformed into pretty storage containers!!! The first one took me about four or five hours to figure out the how-to's (yes, I am slow) and so I got overwhelmed by the five other boxes that needed to be done and put it off. A couple of friends stopped by one day and we each tackled a box. It was fun and made the time go by so fast. We got three boxes covered in one hour and twenty minutes! !